Just over a week after debuting, Animal Crossing: Pocket Camp received its first-ever event geared toward the winter holiday season. With the ability to craft Christmas-themed goodies and own a full Santa suit, it's the perfect time to jump into Nintendo's latest hot mobile game. The aptly named "Holiday Event" began Nov. 30, 2017, and will conclude a month later on Dec. 26. It revolves around candy canes, a new raw crafting material similar to cotton or iron. There is a multitude of ways to earn this delicious currency, which you then use to manufacture your very own holiday wonderland. 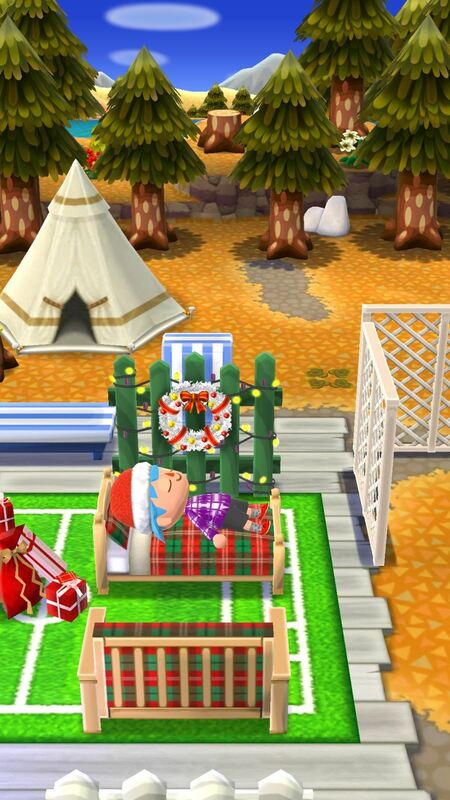 Keep reading to find out how to complete your holiday-themed campsite before this event ends. Getting candy canes is easy. 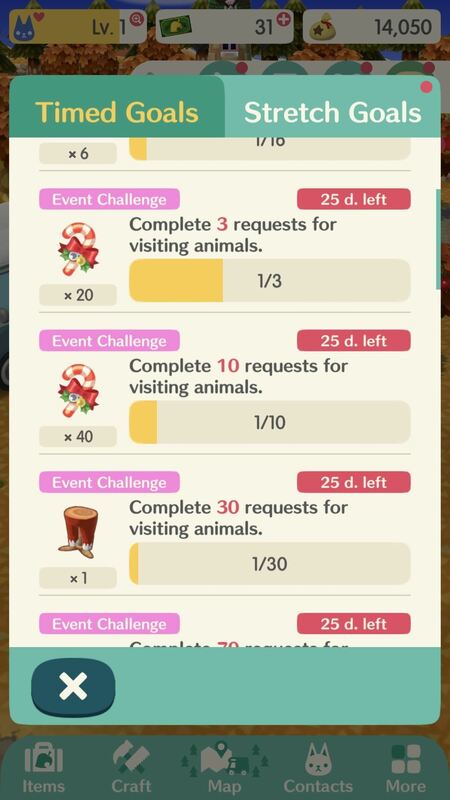 All you need to do is fill requests for your animal friends, just like you normally would. Sometimes when you fill a request, you'll randomly get a "bonus" in the form of candy canes. You'll use these candy canes as to power all your holiday crafting dreams. 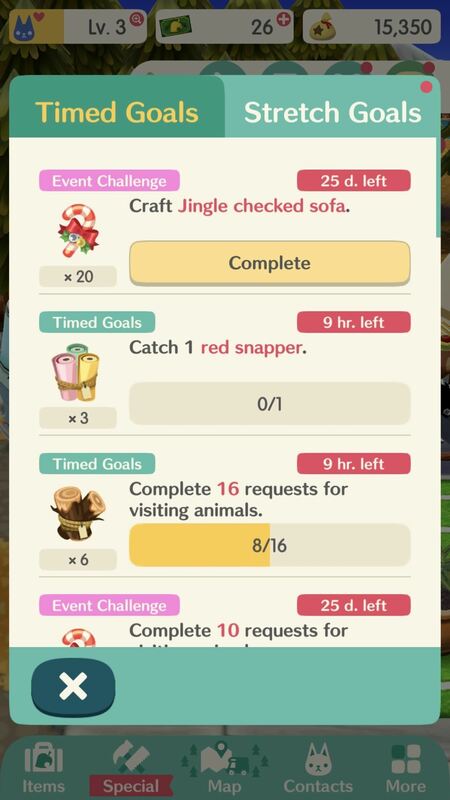 In Pocket Camp, "Timed Goals", which are given each day when logging in, usually change over once per day. However, during the Holiday Event, there are a number of them that won't expire until Dec. 26, so you have plenty of time to get things done. These slow-to-expire goals pay out in the form of either candy canes or Santa suit outfits pieces (hat, coat, skirt, pants, and boots). 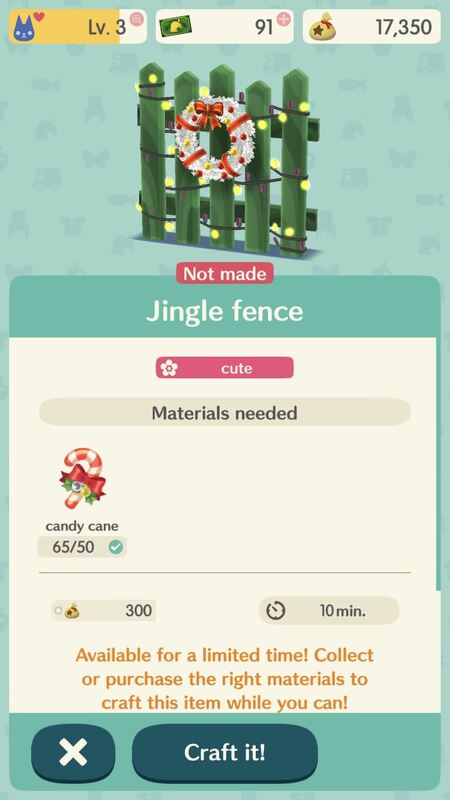 The goals that pay out in candy canes are either ones that require you to fill requests for your animal friends or require you to craft holiday-themed furniture. 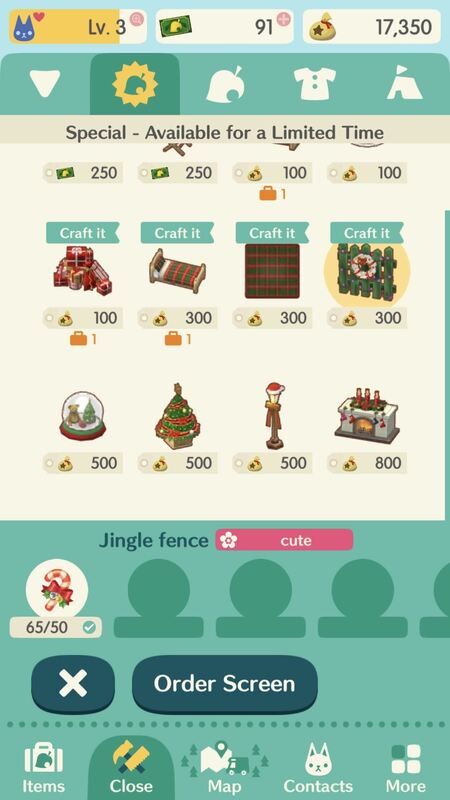 Crafting holiday furniture such as a festive bow tree, three-ball snowman, snowglobe, and jingle fence is similar to crafting regular furniture for your friends. However, getting there is a little different. In the menu on the bottom, tap on "Craft" (which turns into "Close" when you're in the crafting menu). Next, select the icon with the leaf inside the star-like object (this is where special items are located). Next, simply tap on the item you want to craft, and proceed as you normally would. 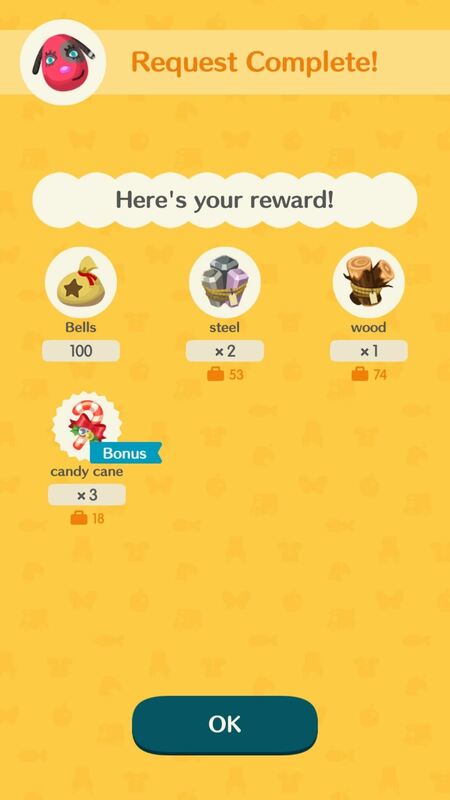 Note that these items require only bells and candy canes, rather than the other materials strewn throughout Animal Crossing: Pocket Camp. Luckily, becoming Santa is pretty straightforward. 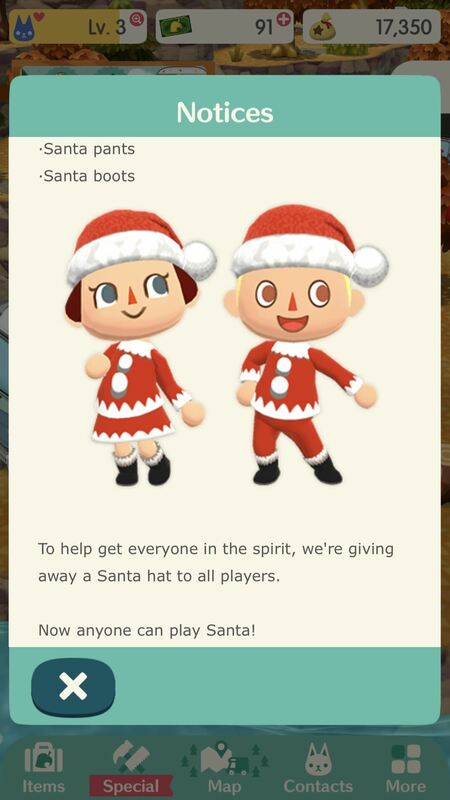 Nintendo will send you a free Santa hat just for logging in, so look for that in your "Mailbox" (via the "More" button) once you start up the game. 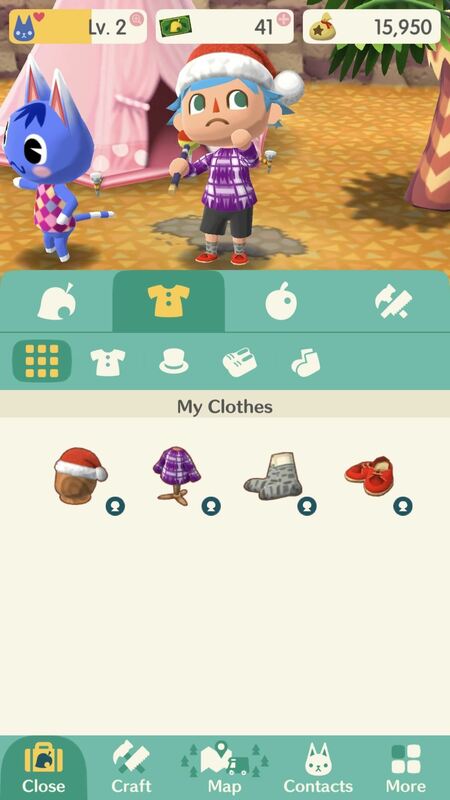 To get the pants, you need to complete 30 requests from animals. For the skirt, you need to complete 70. To get your mittens on the boots and sweater, you need to craft a "Jingle checked rug" for the boots and a "Jingle fence" for the sweater. To equip your new Santa gear, hit the "Items" button at the bottom and tap the shirt icon to view your clothes. Select the new Christmas item and tap "Wear" to don it. How do you feel about this Christmas-themed event? Are you planning on grinding and becoming Santa or sitting this one out and gifting yourself coal? Let us know in the comments below.